In the real world, this may not be the perfect time to glorify a fanatically religious teenage warlord, or to wonder sympathetically what goes through her mind as she’s being burned alive. Yet time elides the difference between terrorists and saints, and Joan of Arc is better known as an equestrian statue than as a bloodthirsty young girl. Arthur Honegger’s oratorio Joan of Arc at the Stake gives us the child behind the icon, a frightened and naïve peasant who swings, in the manner of adolescents everywhere, between stubborn swagger and total confusion. In the brutally satiric and colorfully composed 80-minute piece, her life and fantasies unfurl as a series of spasmodic flashbacks, making it the perfect finale for the New York Philharmonic’s season. The work’s natural habitat is an ordinary hall, with performers in concert dress stiffly arrayed before the violins, but here the orchestra has converted Avery Fisher Hall into an opera house, pulling out the first few rows of seats for an impromptu pit, and building a stage that sweeps up to where an organ loft should be. The director Côme de Bellescize staged the oratorio as a full-scale theatrical event, first at the Saito Kinen Festival in Japan in 2012, and later in France. This is the kind of event that brings out the best in the Philharmonic under Alan Gilbert. For the occasion, the orchestra has transformed itself into a theater company, integrating spoken drama (in French, delivered by, among others, Marion Cotillard) and incandescent music into bold and brilliant entertainment. Honneger is better known for seriousness than subtlety, but he knew how to tell a story. His most famous piece, Pacific 231, summarizes the machine age by dramatizing a train’s acceleration, its jangling climax at full speed, and then the wheezing grind into the station. Joan of Arc is equally vivid, and so are Colombe Lauriot Prévost’s costumes. Red-robed cardinals squawk Latin maledictions, a demagogue in a Maalox-pink pig’s outfit rouses a rabble of sheep, a huckster narrator peddles his magic to a choir of village children dressed in Play-Doh hues. The orchestra plays the bright and rowdy score with gusto, and the combined excellence of the New York Choral Artists and the Brooklyn Youth Chorus give the piece a sagalike sweep. At the center of all this wildness is Joan herself: Marion Cotillard in a simple white dress, at once a firebrand and a silly kid. She is utterly believable as the innocent heart who unleashed bloodshed and forged a nation, never quite understanding what she had done but knowing that it was right. The rest of the cast is French, too, as it must be, since this is a nationalist creation story that depends on diction and a sense of style. The lines can sound over-declaimed to American ears, but the scintillating and ferocious music makes us forgive all. 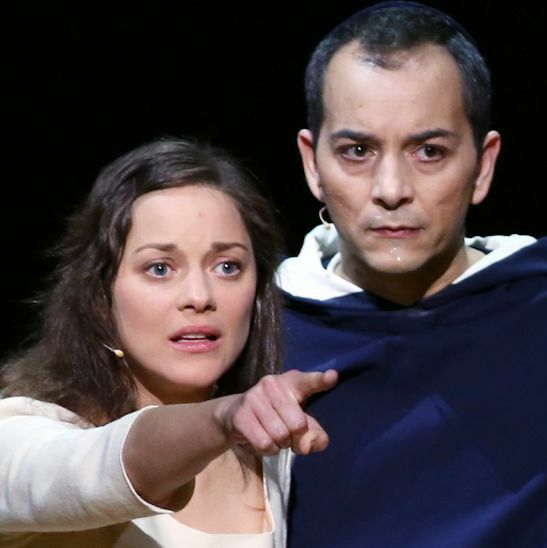 Joan of Arc at the Stake will be performed through Saturday at Avery Fisher Hall.